First things first, let’s just get this straight. I’m not getting married, at least not any time soon. Neither was I the sort of teen that had my wedding planned down to a tee by the time I hit 13. However with all my friends, peers and cousins tying the knot, it’s been pretty difficult not to think about my own big day. My indian heritage means that it’s more than likely, my wedding will be a big, colourful affair and I could, if I wanted to, pull out all the stops. I mean, if I rode in on an elephant no one would bat an eyelid….ok maybe that’s a bit far fetched, but you get the idea. Once again, the event itself is not something I’ve really put much thought into, nor do I want to right now. One thing I have been thinking about however is my wedding dress. There are some brilliantly talented Indian designers out there that are recognised for their amazing work including Sabyasachi Mukherjee, Manish Arora & of course Bollywood’s favourite Manish Malhotra. Most Indian brides can only dream of walking down the isle donning one of their creations. Now, as much as I love their work, I still can’t see myself dressed up to the nines dripping in heavy embroidered bridal wear. So who on earth could I possibly want to wear for my ideal wedding? Ideally, if I had the money (and contacts) I would jet off to India to meet Masaba Gupta. She is a fairly new-ish designer that sells under the label ‘Masaba’. Despite only having a few years of mainstream design under her belt, the talents of this creative (to say the least) designer have not gone unnoticed, as she’s been the youngest designer to showcase at Wills Lifestyle India Fashion Week 2010. At 20 years old, that’s pretty big acheivement! Masaba’s designs are clearly an extension of her quirky personality. She understands and creates fashion that is contemporary with a cultural twist. She has managed to find the right balance for eastern and western style, but more importantly, I really feel that she bridges the gap between runway and high street. Gupta’s designs are wearable and yet there’s something chic and high-end about them. Indian clothing will always be glamourous, there’s just something about the silhouettes and the flow of material that make them so, but that doesn’t mean we need to look as though we just stepped off the set of an Indian film whilst wearing them. Why not have fun with fashion? As far as I’m aware, Gupta has not yet showcased a bridal collection, however I would really love to see what she would come up with. More so, I would love for her to create my wedding dress! So this is a #prrequest to Ms Gupta – if you do ever come across this blog, please get in touch with me, you would literally make my big day! 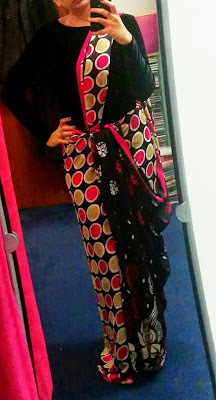 Here’s my attempt at a Masaba-esque outfit/sari I wore this Eid. What do you think? 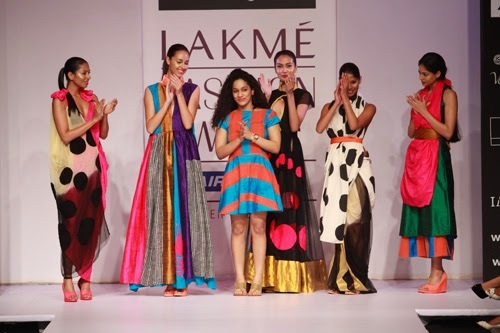 What are your thoughts on Masaba Gupta’s creations?